This blog is an offshoot from my other book blog that I've maintained since 2007. I read so many graphic novels it was time to give them their own blog here which I've maintained since Dec, 2012. Graphic & manga reviews prior to that date are still located on my *other* blog. This is such a unique series. It brings mystery and adventure to learning how to code. 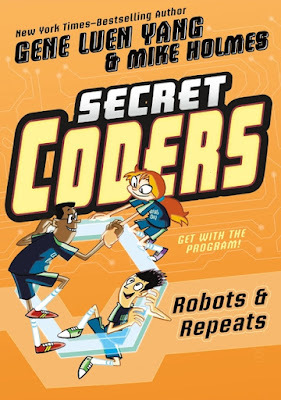 The books build upon each other as they teach coding and the plot continues as well. Still on the search for her missing Dad, Hopper and the guys learn to put repeats within repeats into their coding along with learning how binary code and ASCII work. There are times in the story where it will ask you to write some code or guess what a given code will make. It would be great when this series is finished to publish a workbook to go along with it.